I’m lucky enough live somewhere where we always have amazingly warm weather–and I’m SO grateful. If you’re missing those summertime ☀️ sunshine ☀️ vibes, this margarita inspired mocktail might just uplift your mood. 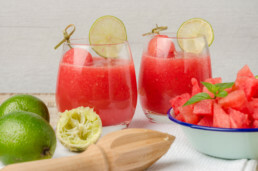 In a blender, puree enough watermelon chunks so that you have 4 cups of watermelon puree. Add lime juice and agave and mix again. Pour into 4 cups. Top each with sparkling water. Garnish each glass with a lime slice or mint leaf.